Par-SORB Ostomy Absorbent Gel Travel Packets 25/pack developed by Parthenon is a specialty ostomy supply that has been designed to offer maximum comfortfor the user. ADW Diabetes offers these Parthenon items in singles and discounted multi-packs for your convenience. 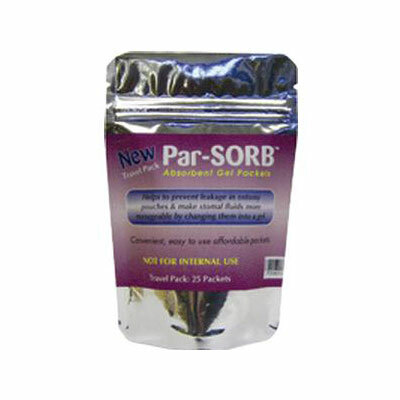 The ParSORB absorbent gel packets are designed to absorb ileostomy pouch contents. ParSORB granules are non-toxic and are packaged within a dissolvable (water soluble) film packet. The packet is easy to use! Just drop the intact packet into the ostomy pouch each time the ostomy pouch is emptied or cleansed. As the pouch begins to fill, the packet dissolves and the ParSORB super absorbent granules become a semi-solid gel that keeps pouch contents away from the stoma. The gel also helps eliminate pouch noise and makes the contents easy to empty. The ParSORB absorbent gel packets were developed to promote patient confidence and support an active lifestyle for colostomates and ileostomates. Noise and peristomal irritation are among the top concerns of ileostomy patients. The super absorbent material in the ParSORB gel packets transforms liquid into a semi-solid gel which keeps the liquid contents away from the stoma, reduces sloshing, and reduces pouch noise. Makes emptying the ostomy pouch easy. Helps keep liquid away form the stoma. Contains 25 Par-SORB Ostomy Absorbent Gel Travel Packets. How to Use: Just drop one or more ParSORB packets into your ostomy pouch. When the liquid comes into contact with the packet, the crystals in the packet absorb the liquid, turning it into a gel.